Last night we got a sitter and went out to dinner and a movie, sans the little phisch. The movie chosen was Clint Eastwood’s Million Dollar Baby. This being the only of the potential Oscar contenders we’ve seen, I still cannot help thinking that none of the other films stack up to this one. It was simply incredible. Hilary Swank captured a Golden Globe for her performance, and deserves an Oscar. Likewise for Eastwood and co-star Morgan Freeman. There are few better on-screen duos for dialogue and banter than Clint Eastwood and Morgan Freeman. The film’s script plays to this strength. Eastwood received a Best Director nod for Unforgiven, and deserves it again for Million Dollar Baby, but this go-around his performance in front of the camera is worthy of Oscar gold as well. We both had the same thought of “He was great in this movie!” afterwards. I’d still like to see Sideways and The Aviator, but based on what I’ve read, the trailers I’ve seen, et al, I don’t think they or Closer or whatever else gets nominated (Academy Award nominations are released on the 25th) can touch Million Dollar Baby. This is so pathetic, it’s frightening. You don’t see Republicans and others on the right whining about being “disenfranchised,” do you? But don’t think it doesn’t happen, because it does. In Social Security, the current generation of workers pre-funds its retirement benefits by making contributions to the program in the form of a tax taken out of every paycheck. In exchange for this tax, the government promises to pay the taxpayer, when he retires, precisely defined benefits, which are specified in law by formula. The amount of money paid in payroll taxes would be more than adequate to pre-fund workers’ retirement benefits were it properly invested, but it is not. In effect, the federal government borrows the payroll tax payments of current workers to pay the retirement benefits to current retirees. But unlike ordinary government debt, the debt obligation owed to workers through Social Security is not quantified and memorialized by the issuance of bond, note, or bill certificates to the workers. Nor is it formally recorded as debt on the balance sheet of the U.S. government. It is real debt nonetheless. What pundits have labeled the “transition cost,” is really the short-term cash-flow crunch that will happen when workers are allowed to invest a part of their Social Security taxes in personal retirement accounts rather than loan that money to the government to pay the benefits of current retirees. This cash-flow problem, however, does not arise because personal accounts create new (i.e., “transition”) costs. To the contrary, the cash-flow problem arises because the government would be borrowing less. Every dollar of a worker’s Social Security payroll tax contribution invested in a personal retirement account is a dollar less debt the government owes to the worker and would otherwise have to pay back in the form of future Social Security benefits. The above URL may require a paid subscription. Mr. Hunter’s essay on Human Events is a shortened version of one he wrote for the Institute for Policy Innovation, but I have yet to find it. Speaking of the 2004 election—where the Republicans retained control of the White House and gained seats in Congress, despite the fact that “the majority of Americans” want the Democrats and Ted Kennedy to speak for them—why does no one in the Democratic Party or otherwise on the Left acknowledge that the voter-disenfranchising districts they’ve been whining about non-stop for the past two months are all controlled by Democrats. It’s kind of hard for the minority party to do the disenfranchising, no? This, of course, explains why the Democrats lost the Presidential election, and lost seats in both houses of Congress. Because the majority of Americans voted for them, you see. …why don’t we see what a Founding Father thought about caring what other nations think of America? This includes the right to defend our national security, at home, and abroad, without interference, collaboration, or permission from any other nation. The best thing we can do about the French? Ignore them. Condoleezza Rice, now Mr. Bush’s nominee for secretary of state, was quoted in 2003 as telling colleagues that the United States should “punish France.” This is a tempting tactic, for it holds out the promise of vengeful satisfaction. It was also the motive behind the recent campaigns to boycott French products. Unbeknownst to most of the participants, however, the consumer strategy was tried without much success in the 1960’s. In truth, Paris isn’t worth a boycott. Moreover, making an example of the French is precisely the wrong approach because it elevates France in the eyes of the world’s anti-Americans, who will always be with us. The one thing France and the neo-Gaullists can’t possibly abide is being ignored. Perhaps that’s punishment enough. “Is it just me, or does anyone else find it amazing that our government can track a cow born in Canada almost three years ago, right to the stall where she sleeps in the state of Washington. And they tracked her calves to their stalls. But they are unable to locate 11 million illegal aliens wandering around our country. So I suppose in the nothing-creative-left-in-our-brains bowels of Hollywood (do you realize how many movies coming out in 2005 are remakes? ), if we’re going to remake a film, we simply cannot cast bad guys as bad guys any more. In the original Assault on Precinct 13, the bad guys were a street gang sworn to revenge the deaths of some of their criminal brethren at the hands of police. They plan to do so by taking out the understaffed and soon-to-close Precinct 13. In the new version, the understaffed and about-to-close precinct that falls under attack seems to be the only plot point making the transition. First, the action moves from Los Angeles to a more snowy clime, made out to be either New York or Chicago. Second, the bad guys bent on taking out those within Precinct 13 are corrupt cops. I guess Hollywood can’t get enough of corrupt cops and rogue military personnel. Are there corrupt cops and rogue military personnel in real life? Undoubtedly. They are also an extreme minority, as most of those involved in the armed services and law enforcement are every day folks just wanting to serve, do their best, and make it home to their loved ones. You would think, though, from Hollywood’s perspective, that every other officer in blue was on the take and wouldn’t hesitate to erase from the face of the earth anyone who looked askance at him. But when was the last time you heard about an entire SWAT team taking down one of their own department’s buildings? I never got beyond the first few issues of Frank Miller’s Sin City, but I always thought it was an outstanding comic. I’ve long been an admirer of Miller’s work, notably on Daredevil and Batman. I was very pleased to see that Robert Rodriguez is helming the film version, and it appears Miller is deeply involved with the project. The trailer is great, and what a cast! So apparently Costco has little debate articles in its monthly magazines, where “experts” offer a pro and con on the subject in question, and members are able to vote. The latest issue of Costco Connection has the results of all of last year’s debates, so I thought I would share. I’m only including the members’ votes. Should the national Do Not Call Registry be implemented? Should the U.S. release the detainees being held at Guantanamo Bay? Has NAFTA been a good thing? Is the Mars Initiative worthwhile? Should baseball have the designated hitter? Are low-carb diets a healthy long-term lifestyle choice? Should foreign-born U.S. citizens be allowed to run for president? Can anything be done to reduce gasoline prices? Should cable and satellite subscribers be able to choose which channels they want? Should obesity be treated as a medical illness? Should you give cash to the homeless? Should we sell naming rights to public places? Much of his protagonist’s argument can be found in a speech Crichton made last year at the Commonwealth Club in San Francisco, in which he took on “the disinformation age.” Challenging the belief that this is “a secular society in which many people—the best people, the most enlightened people—do not believe in any religion,” he argued that the religion to which they in fact give themselves is “environmentalism,” a faith-based fact-lite creed. State of Fear is that 2003 speech in a novel. In fact, according to the group, it is as wrong to question whether global warming is human-induced as it once was wrong for Galileo to believe the earth is not the center of the universe. “Journalists can help keep State of Fear from producing a state of confusion by keeping their focus on the real debate: How will we act to solve this problem?” the council scolded. Translation: You’re not supposed to ask questions. Good people keep the faith. When the Natural Resources Defense Council reverently cited “climate models” and scientists’ “projections” of more warming, as if models and projections were fact, they were behaving just the way Crichton’s fictionalized versions do. And Crichton’s scientist Kenner takes great joy in referring to the predictions made by enviro darlings that didn’t come true. The Natural Resources Defense Council criticized Crichton for his “peculiar contrarian take on global warming.” It shows you how establishmentarian the environmental lobby has become. Anyone else in their 30s and beyond remember the sweeping wave of “scientific proof” in the 1970s that the Earth was headed toward another ice age? I certainly do. What is it in the higher brain functions of seemingly intelligent people that has them trying to prove that every bad thing that happens to the environment is a result of humanity’s “intrusion”? Can we not simply accept the fact that nearly all the time, the Earth is simply continuing on as it has since its creation? I’ve been looking forward to State of Fear since purchasing it up a couple of weeks ago. Having just finished another novel, this review galvanized me to begin it today. Scarborough: Is there a liberal bias in the media or is the bias towards getting the story first and getting the highest ratings, therefore, making the most money? Downs: Well, I think the latter, by far. And, of course, when the word liberal came to be a pejorative word, you began to wonder, you have to say that the press doesn’t want to be thought of as merely liberal. But people tend to be more liberated in their thought when they are closer to events and know a little more about what the background of what’s happening. So, I suppose, in that respect, there is a liberal, if you want to call it a bias. The press is a little more in touch with what’s happening. So you see, it’s not that journalists are biased, it’s just that they know more than everyone else and thus are “more liberated in their thought”! Don’t you feel silly for thinking they were arrogant elitists? We need a few more Peter Fitzgeralds in the Senate, and the House. Like the article says, if all 100 members of the Senate were like him, nothing would get done, but if we had ten or fifteen, more might actually be accomplished for the good of the nation. The notion of prophets being viewed without honor in their native land is an ancient one, stretching back to the book of Mark in the Bible. Here’s hoping that tradition doesn’t hold true this time. While residents of Illinois celebrate the remarkable rise of Barack Obama they should also recall how much better their state is for the fact that Peter Fitzgerald didn’t give a damn if he was re-elected senator. There are three arguments being made in favor of privatizing part of Social Security. First, the Social Security Trust Fund needs money and privatization will, in the long run, increase the amount of money available to retirees. Second, privatization will give people choice, and choice is good. And third, “it’s your money,” and you ought to be able to do with it as you wish. First, it doesn’t take an economist, much less a professor of psychology, to figure out that 401K plans are giving better long-term return rates than Social Security. So actually, yes, Mr. Schwartz, privatization would put more money in the Social Security Trust Fund. Second, yes again, Mr. Schwartz, privatization, of some level, would give people more choice over how to save their retirement money. With my 401K plan, I have a range of funds to choose from. Should I not make as much money at the end of the year, that is as much my fault in picking a particular fund as it has to do with the fund manager’s choices in the companies placed within the fund. Finally, it is my money, you pompous, socialist twit. I can see the money coming out of my check and being deposited in to the largest legal Ponzi scheme (as an accountant I am fond of likes to refer to Social Security—hi, Fred!) in existence. The money I don’t see is the matching funds my employer has to put in to the largest legal Ponzi scheme in existence. Money that I could be taking home with me, money I could be investing in something with far better long-term returns, money that would generate me more in a simple savings account than I will see back from Social Security when I’m 80, or whatever the age will be when I retire. I should be able to do with my money whatever I wish. If I want to work on my retirement funds by going down to the dog track and betting on the one that does his business just before the race, then that’s my business. If I want to dump it all in my best friend’s fad-of-the-moment business, that’s my business, too. It’s not your job, Mr. Schwartz, to ensure that I have money to live on when I’m old. It’s not the government’s job, either. I’m not saying a partial or total privatization of Social Security is the answer. I’m saying that a President and members of Congress need to put the good of the nation before their re-election bids and have the guts to kill Social Security. Pick a year, grandfather in all persons born in that year, and the rest of the population is on its own. There will be a generation or two that will have to both fund Social Security and pay for their own retirements. I would hope there is a generation or two willing to do that, if it means their children and grandchildren wouldn’t have to worry about funding the largest legal Ponzi scheme in existence. I am sure to the chagrin of globalists and the looney left, the Howard administration has determined that it will go it alone when it comes to delivering Australian aid to the its tsunami-plagued neighbors in Southeast Asia. Australia will reject United Nations control and implement its $1 billion aid package to tsunami-ravaged Aceh in partnership with the Indonesian government. The decision to go it alone is at odds with a US move yesterday to disband its “Coalition of Compassion” group and hand co-ordination of relief efforts to the UN. Mr. Howard said the Government was not interested in international agencies, including the UN, delivering the Australian aid. “We’re going to deliver it directly,” he said. Would that President Bush had shown as much spine when it came to dealing with the swindler Annan and the off-the-top-skimming UN. Then, of the present donations in excess of $6B, $600M - $1.2B is a hell of a lot of money not being used for its intended purposes. The more “middlemen” that can be cut out of the loop means more food into the mouths of those that desperately need it. In its ongoing quest to provide the best, most comprehensive, non-partisan news possible, CBS has re-hired Donna Dees as a senior press representative. Ms. Dees will be responsible for the CBS Evening News, the CBS Evening News weekend editions and Face the Nation. You will recall that Ms. Dees was the “concerned stay-at-home mom” who organized the “grassroots” Million Mom March in 2000, with absolutely no help from the myriad celebrities and other “talent” she came in to contact with during her previous stint with CBS, 1987-93. Speaking of the 6.8mm round, SoldierTech also looks at the Barrett M468, which is the weapon being used by those Army Special Forces in Afghanistan. I have to agree that it is the odds-on favorite to replace the M-16/M-4 in 5.56mm, but disagree with Eric Daniel of Military.com on his argument that the military may not want to change because it has so much 5.56 inventory on hand. I see this in no way affecting the services’ decision to move to a new main battle rifle. The implementation of the 6.8 can be done in stages. Basic recruits and state-side soldiers could still use 5.56-chambered weapons, while those deployed abroad and in combat would use the new, more lethal 6.8-chambered rifles. Also, non-deployed Guard and Reserve units could still field the M-16/5.56. As the replacement made its way down from the deployed active duty troops to the non-deployed Guard and Reserve troops, any excess 5.56 inventory could be sold to allies which still utilize the round. Israel, the United Kingdom, and Australia readily spring to mind. I simply don’t see an inventory issue being the deal-killer in adopting the 6.8mm round. Military.com’s SoldierTech has a great article on the Heckler & Koch XM-8 Battle Rifle, which HK is hoping the US military will consider as the replacement for the M-16/M-4 series. The only thing the article fails to mention is how the US services, namely the Army and Marines to date, are exploring the 6.8mm cartridge as a replacement for the 5.56mm. The latter is the current round chambered in the M-16 series, and the XM-8 uses it as well. The 6.8mm round has seen some limited use in Afghanistan with Army Special Forces, and has proven popular when compared to the five-five-six in terms of stopping power. So the 2004 college football season is now officially at an end. Herein is my analysis and comments. No, I’m not going to talk about the big games until the very end, so if that’s all you care about, click on the extended entry link and skip the rest. Below is a handy chart I will reference in more detail. The PAC 10, home of two of the top five teams in the country, sent five teams to bowls. This was three teams too many. One will note that the PAC 10’s #2 team, Cal, was man-handled by lowly-ranked, #21 Texas Tech. This only furthers my case that the PAC 10 is woefully overrated when compared against the Big 10, Big 12, and SEC. The Big East, Conference USA, and the MAC also sent five teams each to bowl games, and this was also about four teams each too many. At least Conference USA had a winning percentage. Speaking of winning percentages, the Big 10 and the SEC both broke even in their bowl bids, going 3-3. This is proof not of the weaknesses in these conferences, but in their strengths, seeing as how in a lot of the bowls being played, these two conferences squared off against one another, or Big 12 opponents. The independents split, with Navy winning and Notre Dame falling, Notre Dame getting the bowl bid solely because they’re Notre Dame, and not having anything to do with the fact that they haven’t had a national championship contender in nearly a decade. Would someone care to explain to me how Navy, at 10-2, is unranked, while Arizona State (9-3), Texas Tech (8-4), and Ohio State (8-4) all made it in to the Top 25? Oh, is it the conferences those teams play in? Is it those teams’ strengths of schedule? Then how does one explain Boise State, Louisville, Utah, Cal, and USC? I only mention this one because our good friend Gary is a Bowling Green alum, and they whooped Memphis. I only mention this one because my parents reside in Birmingham, and UAB getting to a bowl game was the talk of the town. Plus, it was Tommy Chang’s last game in a Warrior uniform, and it was an entertaining offensive shoot-out. Gary is also an Ohio native, so he was clearly rooting for the Buckeyes in this one. They stomped Oklahoma State, whose coach is now moving to LSU, with Nick Saban’s departure to the NFL and the Miami Dolphins. I’m looking forward to seeing what Les Miles can do with the Tigers. Miles has found himself in the same situation Saban was in while in Michigan—in the shadow of a larger, more successful and more popular football program at the state’s other major university. LSU is one of the few teams in the SEC that doesn’t have to share with another SEC school in the state. Miles has taken the Cowboys to a bowl game each of the last three years, and is a coach in the Saban vein. I’m sorry, did the number four team in the country get trounced by the twenty-first-ranked team in the country? Where was that number four team from again? Oh, that’s right, the woefully overrated PAC 10. Unranked Navy, at 10-2, handily beats New Mexico, and still won’t be ranked at the start of the season next year. This was a great football game to watch. Louisville and Boise State went back and forth the entire way. It was really, really entertaining. Still, neither team deserved to be ranked in the Top 10. Finally in a conference that will air more legitimacy to future national title shots, Miami rolls over Florida, which, quite frankly, fell apart. The Gators didn’t look like their normal poised and confident selves, and the Hurricanes took full advantage. I’m just glad Purdue lost, for reasons known only to myself. This was another greatly entertaining football game, with Minnesota from the Big 10 going against the SEC’s Alabama. The Crimson Tide came up short, but this was one of many top conference slugfests that were the epitome of hard-nosed gridiron playing. This was probably the most disappointing of the major bowl games, as Tennessee crushed Texas A&M. The Aggies, in a rebuilding year, had fought their way in to the Top 25, and look to be turning their program back toward success. I was honestly surprised it got out of hand for them, but was glad to see another SEC team gain a victory. Another great Big 10-SEC contest, with Georgia outlasting Wisconsin. I fully expected this to be a knock-down, drag-out slugfest, and I wasn’t disappointed—except with the final score. Iowa and LSU, two teams which should have been in the Top 10, participated in a purely defensive contest for three quarters, before their offenses blew it open in the fourth. The Tigers looked to have put the game away, but with 31 seconds left, the Tiger defense, in prevent mode, had the Hawkeye offense blow by them to score a touchdown on the last play of the game for the win. I have long maintained—and I acknowledge my dad for putting forth this maxim—that the prevent defense only prevents the defense from stopping the offense. To this day, I have not seen a team successfully use a prevent formation to stop the opposing offensive unit. Maybe the Tiger defense was simply the first to tire. Maybe the players’ hearts were give out, trying to earn their coach a win in his final game. Maybe the coach, his mind already on a jet plane to Miami, forgot what sort of play won LSU a national championship last year. For whatever reasons, it was a heartbreaking loss for the Tigers, and Iowa is to be commended for their never-say-die attitude, and pulling out the win. I can’t wait to see the Neilsens for this week. I’ll be shocked if the contest between Utah and Pittsburgh even registered. The big story here was how Utah was the first non-BCS conference team to make it to a BCS game. Yeah, they were undefeated. In the Mountain West Conference. Heck, Florida State or Miami deserved to play in this bowl more than Utah did. This game had the feel of a national championship game. What a clash of titans here, as Texas and Michigan met for the first time ever. This was a great football game, with all the high drama that comes with such a contest. The Longhorns last-second field goal pulls it out for the Lone Star State. This game alone was testament to the greatness of the teams’ respective conferences. And Auburn wins the national championship. Oh, there’s another bowl the night after this one? That bowl is for the BCS national championship? Oh. By the way, Mr. Leinart, it doesn’t show a lot of class for a Heisman Trophy winner to throw a hissy fit over taking a safety when his team is up 55-10. Mr. White, a fellow Heisman Trophy winner, and on the losing end of that 55-19 score, seemed to hold his composure much better. Then again, what was I expecting from a guy who earlier in the season wore a “F*ck the BCS” t-shirt for a nationally-televised interview? By the by, I fully expect that this game will be lower in the Neilsens than both the Sugar and Rose Bowls. So let’s talk about the national championship. USC and its fans, including those incredibly-biased media and coaching voters, now declare the Trojans to be the one and true national championship team. I have long lamented how flawed the BCS is, most of it due to the incredibly-biased media and coaching voters. Despite its many flaws, however, the BCS was set up to ease the determination of a true national champion. Like it or not, the BCS was designed to have the number one and two teams in the nation fight it out for the title. It’s a shame that a worthy number three team is left out in the cold. As what happened to USC last year. So let’s see, Trojan fans and players: if you want the rest of us to acknowledge that you, as the BCS national championship game winner, are the undisputed #1 team in the nation, will you do the same for the 2003 LSU Tigers? Yeah, I thought not. For the last time, USC worshippers: if you want to blame anyone for there not being a USC-LSU championship game last year in the Sugar Bowl, look to that incredibly-biased media and coaching voting segment that put Oklahoma there instead of you. This is the same incredibly-biased media and coaching voting segment, mind you, that ensured, all season long, that USC would compete for the national title this year. Just as last year we should have seen a USC-LSU match-up, this year we probably should have seen an Auburn-Oklahoma match-up. Jason Campbell, in his last press conference as an Auburn player, makes one hell of a case for a national title to reside on the plains of Alabama. Put this in your crack pipes and smoke it, southern California: in every BCS category except poll voting, the Auburn Tigers kicked your butts. Yes, it is a big deal for you to come in and whip the Big 12 champion the way you did the Sooners. I’m not trying to take anything away from your Orange Bowl victory. I simply take issue on whether you should have been there in the first place. So enjoy this moment in the sun, USC. No doubt you will find yourselves atop the rank of college football’s best at the beginning of next season. No doubt, with a strong number of your current talent slated to return, the incredibly-biased media and coaching voting segment will ensure your return to the BCS national championship game again. I think Coach Nick Saban had something last year, when questioned, before the Sugar Bowl, over the prospect of a “shared” championship. He thought the BCS system was pretty good, but in order to totally eliminate the sharing prospects, he recommended the “BCS plus one.” Auburn coach Tommy Tuberville echoes the “plus one” scenario, as he finds himself in similar straits as Saban this year. Wouldn’t that be something? To have one more game, USC against Auburn for all the marbles. Because if I were a betting man, I’ll take an undefeated SEC team over an undefeated PAC 10 team any day. 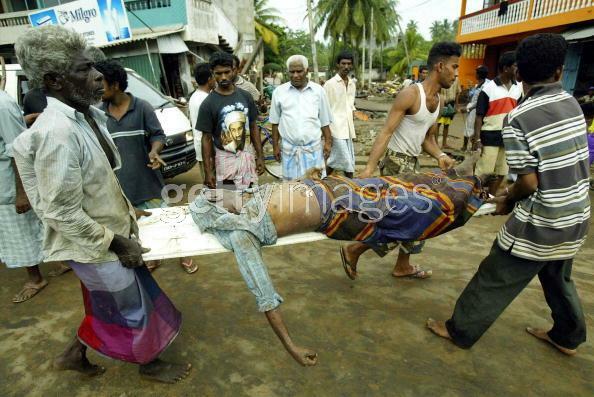 Well, we’re heading into Day 7 of the Asian quake/tsunami crisis. And the UN relief effort? Nowhere to be seen except at some meetings and on CNN and BBC as talking heads. In this corner of the Far Abroad, it’s Yanks and Aussies doing the hard, sweaty work of saving lives. The UN is a sham. When are we going to get a president and enough members of Congress with the guts to cut off funding to, and remove from our soil, this useless and irrelevant “organization”? “Blacks are the victims of law school programs of affirmative action, not the beneficiaries.” —Richard Sander, UCLA law professor and economist, father of a biracial son, lifelong Democrat, a liberal on most issues, with a long record of involvement in civil rights issues, including housing segregation. Mr. Sander set out to prove that university affirmative action admissions practices were benefitting blacks, and arrived at the precisely opposite conclusion. Last month, the “Liberty Belle” became the 14th B-17 Flying Fortress to return to the skies. That’s right, there are only fourteen of these classic air warriors in the entire world stil flying. For the kiddies who aren’t getting taught authentic American history in school any more, this was the bomber that helped win the war in Europe during World War II.